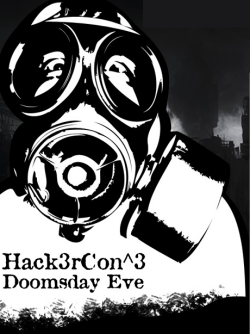 Hackercon 3 (Doomsday Eve) starts Friday. This edition of the annual information and cyber-security symposium will explore Doomsday and survival scenarios in the age of the internet. Hackercon 3 runs Friday through Sunday at the Ramada on Kanawha Boulevard (formerly The Charleston House Holiday Inn). Some of the workshops will take place down the boulevard at Digiso. Events kick off at 8 AM Friday, and you can find a full schedule here. the film, “Reboot” will be shown in the ballroom at The Ramada at 10 PM Friday night. The description of the film from their PR says, “Set within a dystopian world that is a collision between technology and humanity, “Reboot” touches upon many of the current social and political concerns that arise from becoming more and more intertwined with the virtual. It should be a fascinating, informative and fun weekend, and cyber-minded individuals should definitely have this on their radar.